Description: About the last thing shy and lonely Joseph wanted to do was live on campus at seminary. But when he finds a beautiful afghan on his dorm room bed and attempts to track down its maker, Joseph runs headlong into a series of events that might just lead to something called… love. 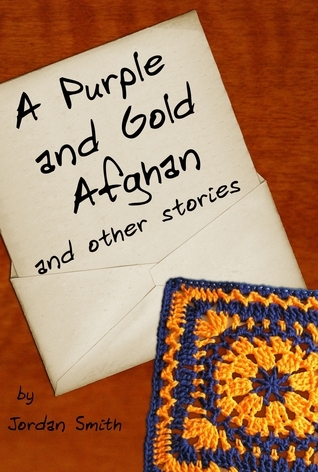 Charming, whimsical, and poignantly funny, A Purple and Gold Afghan and other stories is a delightful collection that will tug at your heartstrings. It has been ages since I have read short stories that were so good. Jordan Smith has so much talent, I hope he writes more. He was able to develop the characters well and make you feel like you know them in only a page or two. I love how Joseph argues with himself. I do it all the time. I could really relate to his internal struggles. He made me laugh many times, as well as think. I don’ think you could ask for a better main character for a short story. Although these stories were short, I didn’t feel like I was missing information. It was nice to read these stories in a matter of an hour, and enjoy them. I recommend these to anyone who needs a quick, enjoyable, and well written read.